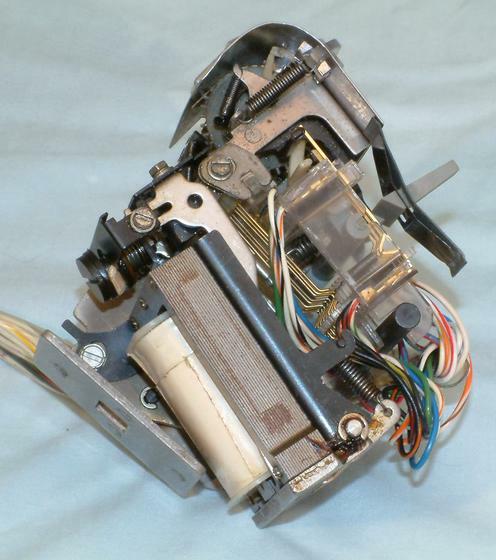 This is the right side of the ASR 33 Teletype paper tape reader. The sense pins are attached to the white plastic blocks which the gold contact wires rest in. If a hole is in the paper tape above the pin when the electromagnet at the bottom raises the pins it will cause the gold wires to contact the common bar attached to the black and white wire closing the circuit for that data bit. The clear plastic used is not very stable. During cleaning, part of it holding some of the contacts broke. It may have been due to the contact cleaner I used. It is supposed to be safe for plastic and I have used it on contacts in plastic before. Probably best to not use any chemicals on it if you are working on a teletype. A little super glue and it is functional again.